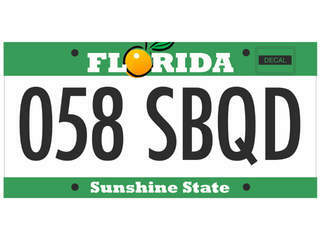 MIAMI BEACH – Following a poll, Floridians have chosen a new license plate tag. The poll was done online. The plates have seven characters so that the State does not run out of combinations to distribute. Highway Safety Chief Julie Jones Jones pushed for flat plates so that red light cameras could see them easier. Apparently, a good number of red light violations cannot be substantiated because the cameras cannot read the raised letters and numbers. But the group PRIDE opposed her. PRIDE manufactures the plates with help from inmates. Apparently, they do not have the technology to make a flat plate. There were quite a bit of complaints about the plates. A photo is attached. They don’t look so bad to us. The main point of a license plate is so that police and others can identify a vehicle. License plates become important following hit and run accidents. Many times, witnesses on the scene write down a plate of a car that hits other cars or pedestrians. Then, the police or a private investigator tracks down the runaway driver. Leaving the scene of an automobile accident with injuries is a crime. But it happens often. The new plates appear to be more legible. From a safety and accountability standpoint, that is all that counts.